If you are running Ubuntu 10.04 LTS or 10.10 and your scanner is not supported, then you can try the latest releases of the SANE drivers from my sane-backends PPA. 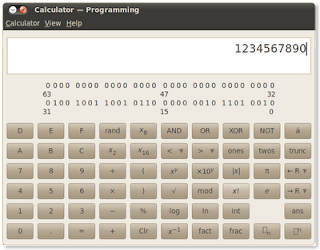 The following steps from the terminal will enable it. Please feedback to the SANE project if you continue to have problems! In the Ubuntu Desktop team we're currently packaging GNOME 3 components for Ubuntu as per the blueprint decided at the last Ubuntu Developer Summit. If you're already brave enough to be running Natty, then you can additionally try some new GNOME 3 applications by adding the GNOME3 builds PPA into your sources. Expect the usual - the packages may not work perfectly, and it's non-trivial to downgrade, so be warned! We're going to evaluate these packages in the PPA and decide how many are appropriate to include in Natty. It must be time to update on how progress is going with LightDM. There's been some interest in writing a QT based greeter, and I hope we'll be able to show that working soon. I've started to write some documentation. I non-proposed LightDM for inclusion in GNOME 3 (I don't feel it will be sufficiently ready in time). This raised the idea of should we switch display managers in the future and got some good feedback. We had a UDS session on LightDM which also gave some good feedback. 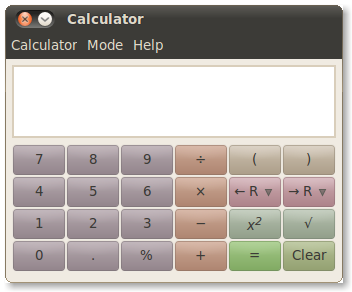 The outcome is that I plan to make LightDM easily installable in Ubuntu 11.04 as an alternative display manager. When I first heard of Vala I was not impressed. A domain specific language? That seems like a dead-end; how would we every attract developers to the GNOME platform? After a while of thinking about it I realised that GNOME already was in this position. GObject+C already is a domain specific language. New developers already have to learn GObject and finding developers who both are proficient and willing to use C can be a struggle. Recently I have been working on more and more with Vala and porting applications from PyGTK/C to it. Before Vala, PyGTK had a lot of advantaged over C; now the main differences are easy debugging and fast development (Python) vs fast performance and type checking for easier maintenance (Vala). So, my recommendation is if you have a desktop application that uses GObject APIs* and you are happy with debugging tools like gdb and valgrind then consider using Vala! * I was working on porting LightDM to Vala but old system APIs were causing difficulty. If you have this case consider wrapping them in C+Gobject first and then interfacing to that. Then come along to my session at UDS. It's at 5:10pm EDT and you can join remotely by connecting with IRC to irc.ubuntu.com #ubuntu-uds-bonaire2 and listening in to the audio stream. Everyone is welcome and I'm particularly interested in gathering requirements for derivative distributions. I'm at GUADEC all this week so if you have any questions/comments about Ubuntu Desktop, LightDM, Simple Scan or GCalctool feel free to find me! I'd like to announce a side-project I've been working on: The Light Display Manager (LightDM). Got bigger plans? Read the libldmgreeter reference. Idea - make an OpenGL interface that uses Mii avatars. libldmgreeter not in the right language for you? It supports GObject introspection so you should be able to write a greeter in any introspetion enabled languange (e.g. Python). And the interface to lightdm is D-Bus so you can go more direct if you want. Wait, what is a display manager again? 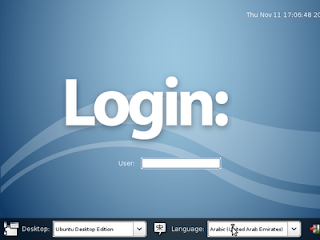 The display manager handles the running of the X server (graphical display) on your system. 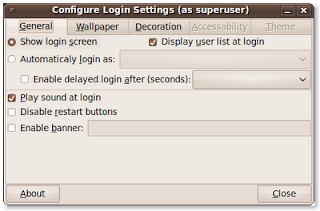 It also provides the login screen (greeter) to authenticate users. This is a personal project developed in my own time. Patches, feedback and help welcome. What about the other display managers? LightDM aims to support all use cases of the current display managers, from embedded to desktop systems. LightDM is still in early development and not suitable for use in production systems. Source is in Launchpad (bzr clone lp:lightdm) and tarball releases. At UDS we planned discussed how Ubuntu will support GObject introspection. I am currently working on packaging PyGI for Maverick. You can read more about this in a blog post from Tomeu Vizoso who came to the session and is an upstream developer for Telepathy, GNOME and Sugar and helped inform us about GObject introspection and PyGI status. If you've just read Paul Cutler's blog post about Mallard documentation and want to get involved, consider translating some of the GNOME Games help! The games are a good project to start with because their help is relatively simple. I've opened bugs against Sudoku, Mines, Mahjongg and Quadrapassel (Tetris), leave a comment if you start working on it. To get started look at the existing documentation either by running the games or browsing the help in git. Learn about Mallard by doing the ten minute tour. 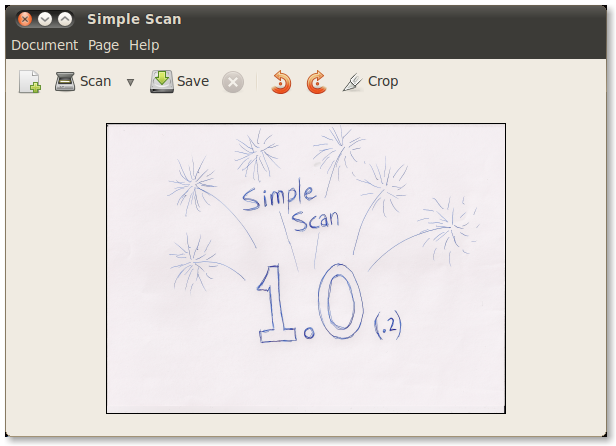 Last week I hit 1.0* for simple scan. It's not perfect but it appears to be reliable and is an improvement on the existing scanning experience. I've prosed simple-scan for GNOME 3.0 and will be following the GNOME release schedule from now on (next release will be 2.31.1). (Provided so you can run the Karmic gcalctool in Lucid if the interface is more useful to you). (UPDATE: We've decided to stick with GCalctool 5.28 for Lucid so this PPA is obsolete). Thanks to a a patch from Alexey Kryukov glChess now supports themes in SVG. Thanks Alexey! This is a letter to all those who think change = bad. If you don't want your software to change then don't upgrade. If you want your software to improve then expect (and enjoy) change. 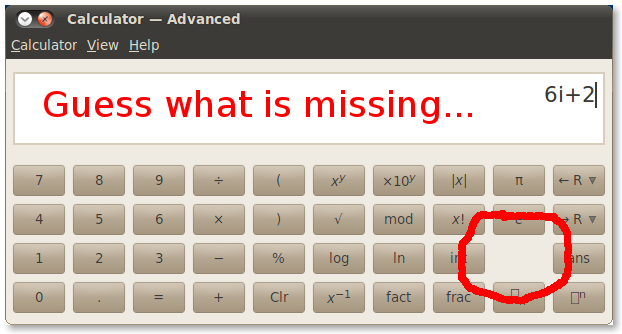 If a feature is present in a version X, then that feature may not exist in version X+1. This is not a regression - applications don't exist to provide features; they exist to serve the users that the application is targeted at. Default applications are there to serve the greatest number of users. 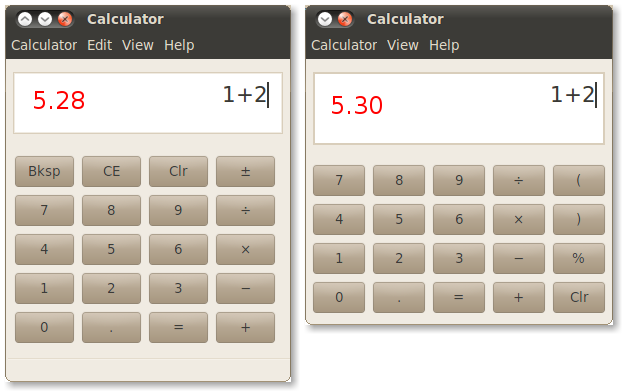 In both the proprietary and open-source worlds there is often a "basic" and an "advanced" application for a given task. This is a good thing - trying to please everyone isn't as good as focussing on one group. If there is an application that better serves your need then use it. 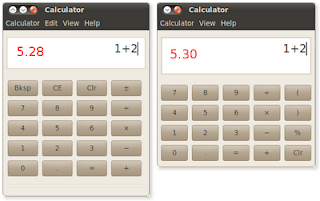 (If you are an advanced user then use an advanced application). 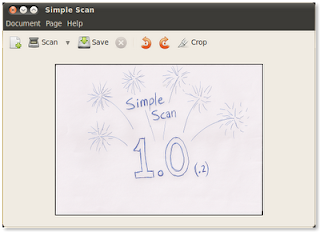 Simple Scan is not a replacement for xsane or gscan2pdf. But it is great if you have a picture you want to upload to Facebook. GCalctool does not have the features of Qalculate or wxMaxima. But it does solve common equations. 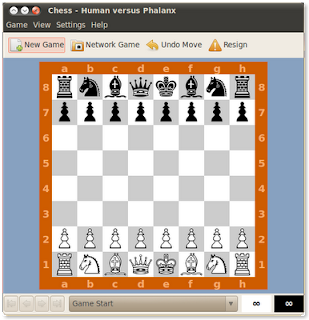 glChess would not be used by a experienced chess player like xboard. But it is a good introduction to the game of Chess. GCalctool 5.30 is now released. Gcalctool is the default GNOME calculator and this is also the default in Ubuntu. 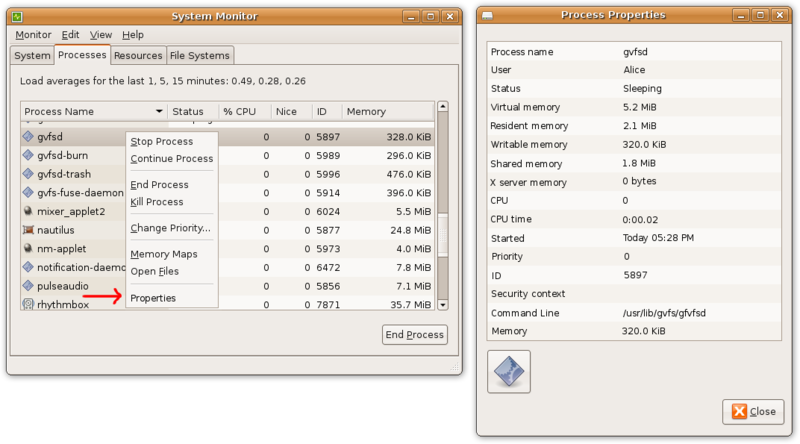 Both GNOME and Ubuntu use a synchronised six month release cycle. The great thing about regular releases is... Predictability! Here's my summary of what to expect in GCalctool 5.30. 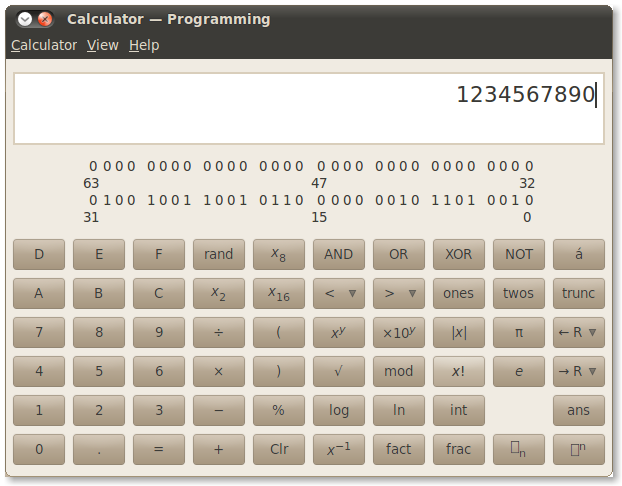 Hexadecimal numbers are harder to enter (you need to explicitly add the base 16 suffix (Ctrl+H) to them). 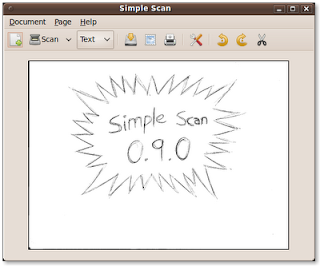 A few days ago I released simple-scan 0.9.6. This version is the 1.0 release candidate. There may be some issues with scanning from an automatic document feeder (ADF). Please comment on bug 512553 if you are having problems. (I don't have an ADF to test). The generated PDF files do not JPEG compress the images. 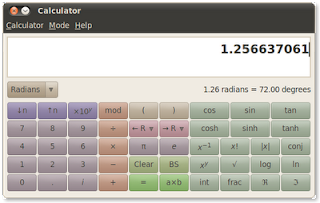 This is because the Cairo renderer does not support it. If you know of a C accessible library that can do this or even how to hard code this (the PDF files are just a single image per page) then please comment on bug 534122. You can now view GCalctool manual online in the awesome GNOME Documentation Library (it automatically updates with each release). 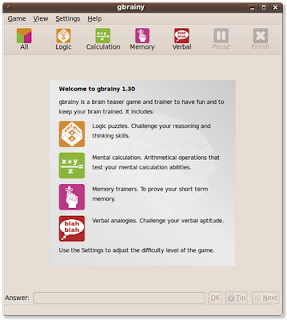 Ubuntu Lucid Alpha 2 has just been released and a new addition is the mind puzzle game gbrainy. You can read more about the latest release in a blog post by Jordi Mas (the author). gbrainy is a great game and we want to find any problems before final release so please try it out! If you don't already have it installed then you can get it from the Ubuntu Software Centre (search for gbrainy). If you find a problem the best thing to do is file a bug in GNOME. If you don't have an account on GNOME Bugzilla but do have a Launchpad account you can file a bug against Ubuntu. 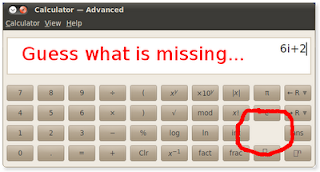 I am working on getting the "Report a Problem" menu entry into the help menu which will make this even easier!